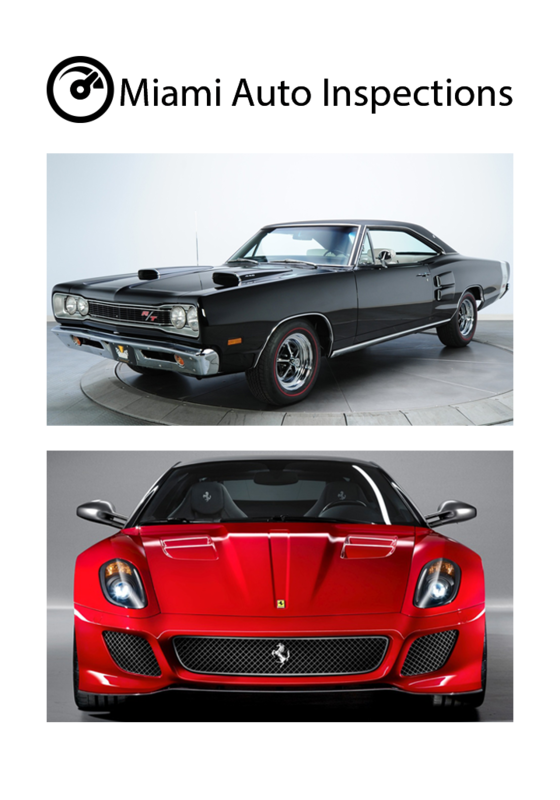 Specializing in Exotics, Luxury and Classic vehicles inspections. 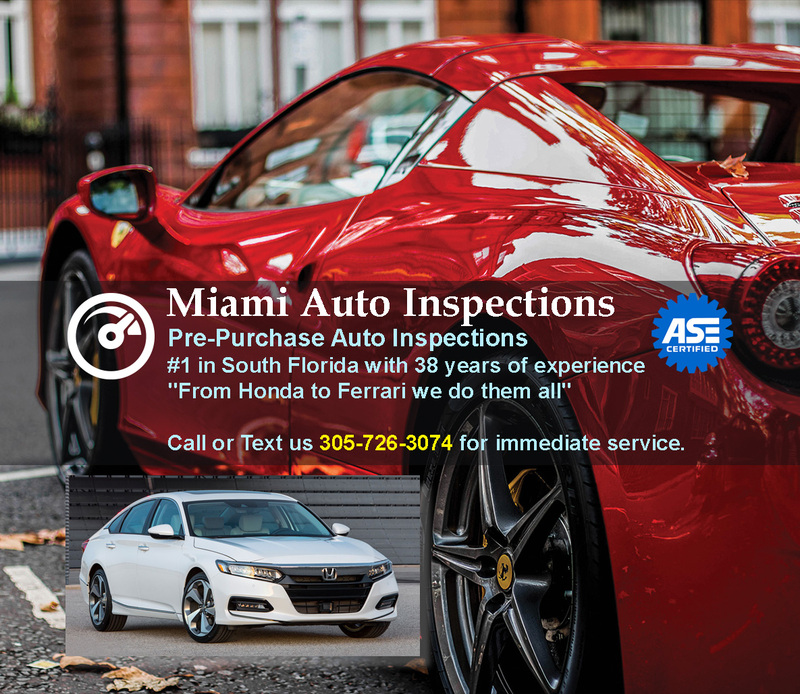 "From Honda to Ferrari we do them all"
Miami Auto Inspections, provides a comprehensive fast and friendly service to anyone thinking about buying a used vehicle. With 38 years of hands-on experience in the motor industry, you can rely on us to ensure that your purchase will be all that you expect both from a reliability and a mechanical aspect. One of the most useful and frequent services that we provide is the inspection of a vehicle located a good distance away from your current location. Use Miami Auto Inspections to check out the vehicle for you and we will provide a pre-purchase inspection which will give you the confidence you need in your purchase. If your considering using my competitors services ask if the on site inspector has been granted the highest certification of master machanic. 38 years of working on the most desirable cars in the world. We are located in North Miami Beach between two international airports. 38 years of automotive experience. Head mechanic for large exotic car dealerships including Ferrari, Maserati, Lamborghini, Lotus, and Porsche. Extensive experience with classic sports cars. Owned and operated performance oriented automotive shop. Hand on experience with restorations. Address: 1885 NE 149th Street Suite F.
Cars, Trucks, Motorcycles, SUV, Classics, Exotics cars inspection. A thorough panel-by-panel external visual inspection of the vehicle - including paint condition, rust, evidence of body filler and poor panel alignment. We check for signs of body flex like stress cracks resulting from a weakening body frame. We also inspect the undercarriage, looking for evidence of major collision repairs, corrosion, fluid leaks, or any obvious recent repairs that may indicate existing or future problems. A test drive of the vehicle to evaluate any detectible problems in the engine, transmission, steering, suspension, and brakes under various driving conditions. A visual inspection of the interior including correctness of materials used on the seats, carpets, headliner etc. We check for signs of water infiltration, condition of floor pans as well as a check of all instrumentation and electrical equipment. Every vehicle is road tested. "Ideal for those who want total peace of mind." There is no guarantee expressed or implied. By hiring Miami Auto Inspections you agree to the ”Terms and Conditions” listed on this website. Our agents are trained and eager to assist you. We will respond to your questions as quickly as possible. 1885 NE 149th Street Suite F.